Motherwell crashed to a 2-0 defeat against Aberdeen at Fir Park on Tuesday night which officially means that the Steelmen can't finish in the Scottish Premiership's top six this season, writes Craig Goldthorp. The first genuine chance of the game came after 19 minutes when Aberdeen's Greg Stewart beat Motherwell defender Stephen Hendrie, cut inside and shot over the bar. Aberdeen were bossing the match in the early stages and the effective Stewart then sent in a cross which saw Kenny McLean's header blocked by Hendrie. It was not a classic in the opening 45 minutes but things livened up with six minutes of the first half remaining when Motherwell's Richard Tait hung a cross to the back post and Elliott Frear's headed attempt was blocked. 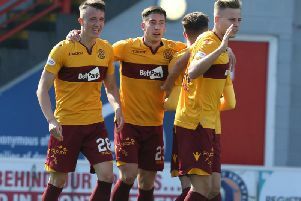 Motherwell - who made a half-time switch when Allan Campbell was replaced by Gael Bigirimana - came close to scoring just two minutes into the second half when Chris Cadden's corner was headed just wide by Tom Aldred. Curtis Main then outmuscled an Aberdeen defender and produced a stinging shot which keeper Joe Lewis saved. The Steelmen then survived a scare when a mistake by defender Cedric Kipre was pounced upon by Stevie May whose shot was blocked. But Aberdeen then stunned 'Well with two quick goals, firstly breaking the deadlock when centre back Kari Arnason headed in a 65th minute McLean corner. And it was 2-0 within two minutes when McLean sent a fine left footed shot into the corner after a Stewart pass. The Dons then dominated most of the remainder of the match, although Motherwell created a chance when Bigirimana sent a crossfield pass to substitute George Newell whose shot was blocked by a defender. Motherwell: Carson, Tait, Hendrie, Cadden, McHugh (Newell 77), Main, Frear (MacLean 63), Bowman, Aldred, Kipré, Campbell (Bigirimana 45).